For generations, popular card games have been entertaining people at parties and during quiet evenings at home. From bridge clubs with grannies to never-ending games of War with kids, card games can entertain people of all ages. All it takes to play is a deck of cards and knowing the rules for a few of the most popular games. A traditional 52-card deck is used for a plethora of card games. A few of the games can be played solo, but most are best played with a few others. Royal flush: The highest five cards in a suit. 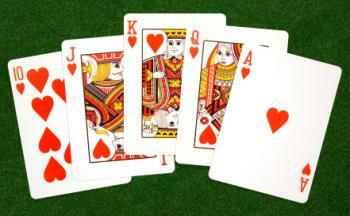 For example, an Ace, King, Queen, Jack and ten of hearts. Straight flush: Five cards of the same denomination in sequential order. For example, a three, four, five, six and seven of clubs. Full house: Three of one denomination and two of another. For example, three Queens and two eights. Flush: Five cards of any denomination in the same suit. Straight: Five cards of any suit in sequence by denomination. Three of a kind: Three cards of the same denomination. The higher the denomination of the cards, the more the three of a kind is worth. Two pair: Two pairs of cards of the same denomination. For example, two sixes and two Jacks. One pair: Two cards of the same denomination. The higher the denomination of the cards, the more the pair is worth. Hearts is a trick-taking card game that is internationally popular. While the name seems to suggest hearts are good in this game, it is actually the opposite. Unlike other trick-taking games there is no trump. Instead, penalty points are awarded for tricks containing hearts and the queen of spades. The game continues until one player gets at least 100 penalty points and the player with the fewest penalty points at the end of the game wins. Each player is dealt 13 cards. Each player passes three cards to the player on his/her left for the first hand, to the right the second hand, opposite the third hand and none on the fourth hand. The player with the two of clubs starts the first hand by playing a card of any suit. All other players lay down a card of that suit, if they have one, or another suit if they do not. The player with the highest card of the suit lead wins the trick. The winner of the trick starts the next hand. 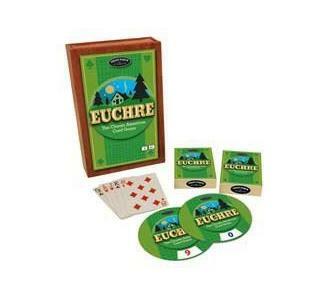 Another trick-taking game, Euchre has been popular since the 1800s and is known as a social game, inspiring regular meetings of Euchre clubs across the United States. It is usually played with four players who are partnered up. Partners sit opposite each other around a table. While the game uses a standard 52-card deck, only the nine through Ace cards are in play. The remaining cards are removed from the deck. Once the cards are dealt, the object of the game is to take tricks and the first team to reach 10 points by taking tricks wins the game. Deal five cards to each player. The remaining four cards are placed face down and the top card in the pile is turned over to represent trump. Starting with the player on the dealer's left, players have a chance to declare the turned over card trump or pass. Once a player declares the card trump, he picks up the trump card and discards one of the cards in his hand. 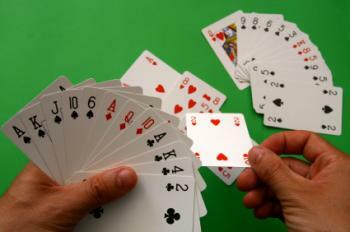 His partner also has the option of passing him the two best cards in her hand, which means that the caller plays alone. The player to declare trump leads with a card and all other players must play a card of that suit, or another suit if they do not have the suit that was lead in their hands. The player who plays the highest card takes the trick and leads the next hand. Play continues until all cards have been played and teams earn points based on the number of tricks they have. The team that declared trump must take at least three tricks to earn one point. If they take all five tricks, they earn two points. If they fail to take three tricks, the other team gets two points. In Euchre, the rank of the cards is also unique. 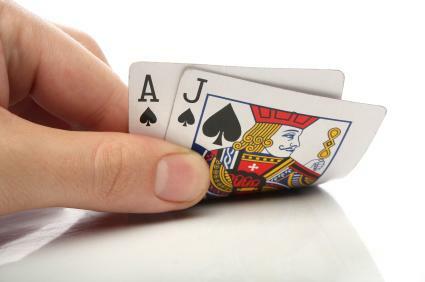 During play, the Jack of the trump suit is the highest card, called the right bower. The Jack of the same color is the second highest card, called the left bower. From there, the cards are ranked Ace through nine. Bridge was declared the number one card game in the United States in 1958 and it has continued to be popular in circles of older and wealthier Americans, particularly women. While it is a traditional trick-taking game, where players play based on the card that is lead, the game itself is fairly complicated. Before playing the game, players engage in a complex bidding process. While any suit can be declared trump, spades and hearts are the highest suits when it comes to bidding. Players can choose to bid by saying how many tricks of a trump suit they will take or bid with no trump. From there doubles, redoubles and dummy play are introduced. Those who take the time to learn how to play bridge find it entertaining, but the amount of rules and terminology often scares many people away from the game. Blackjack, the most popular gambling game next to poker, can be played solo or with multiple players. When played for money the game often involves betting and slightly more complex rules, but played at home, the goal of the game is simple: try to get as close to 21 as possible without going over. To play, you are dealt two cards face up. Once you see your two cards, you can choose to hit or stay. When you hit, you receive another card to raise your total closer to 21. When you stay, you keep your cards at the current number and hope your total is higher than the other players' at the end of the game. For scoring purposes, all face cards are worth ten points and an Ace can either be worth one or eleven points. Even kids can get in on the card game action. While they can be taught to play poker, euchre and some of the more popular adult card games, there are also card games designed to appeal specifically to a younger audience. Go Fish is the perfect card game for kids just learning to make matches and nearly every child has played the game at some point. The rules of Go Fish are simple enough for even preschoolers to understand and kids will have a lot of fun telling each other to "go fish!" in the pile of extra cards if they do not have a match in their hands. While a traditional deck of cards works for the game, you may also be able to find decks designed just for kids featuring popular characters, shapes and pictures. You can play Crazy Eights with a traditional deck of cards or buy one of numerous decks designed for playing this popular card game. 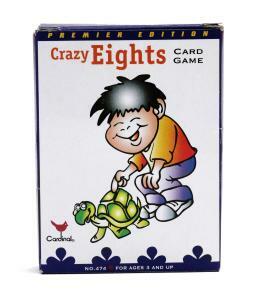 The goal of Crazy Eights is for kids to get rid of the cards in their hand and the winner is the one who does it first. The rules are simple. Each player is dealt five cards. The remaining cards are placed in face down in a draw pile, with one card turned up beside the pile to start the discard pile. Kids take turns discarding one card at a time by matching either the number or suit of the card on top of the discard pile. If they can't play, they must draw from the draw pile until they can. War is a simple card game that can go on for hours. Because of its simplicity, most kids have memories of playing the game with siblings and friends and saying "I declare war!" with gusto. This game is typically played between two players, but it can easily become a three of four player game. To play War, all cards are dealt out to the players and placed in face-down stacks. Players each lay down the top card on their stacks. The player with the highest card of the cards laid down wins and adds the cards to the bottom of the pile. If the cards are the same, players declare War. When that happens, players lay three cards face down and turn a fourth card up. The player with the highest card takes all of the cards laid down. If there is another tie, another war ensues. The loser of the game is the first to run out of the cards or the one with the fewest cards when one or both players are tired of the game. Not all card games require a traditional deck. Still a relatively new game, Apples to Apples is popular with all generations of card players and has even been inducted into the Games Magazine Hall of Fame. With green topic cards and red adjective cards, players choose what red card they have that best fits the green. Play it literally, play it to the judge as a nod of a special inside joke - either way you are sure to get great laughs and hours of entertainment. Uno, known as America's number one card game brand, has been loved by both children and adults for a long time, and its concept is simple - match the cards and colors, and be the first to have only one card remaining. Wild cards and updated versions including Uno Attack! have continued the momentum of popularity for this card game, and the price is definitely right when you're looking for a fun night in. A bonus with Uno - almost everyone knows how to play it, so you can jump right in. 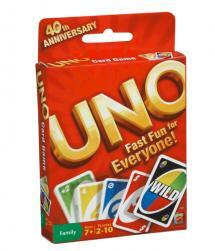 And if someone in your camp has never had an Uno experience, it is very quick to learn. The beauty of a good old-fashioned card game is still appreciated by many friends and relatives across the country, and you have plenty of good reasons to play one. Card games allow for personal interaction that more modern amusements such as movies and video games do not provide. You can work up a good conversation during a card game, and get to know each other better if you're with a group that you aren't too familiar with. Card games are also great on a budget. In today's economy, movies and dinners out can add up quickly into an expense that many households cannot manage. Bring your friends and family together for a good, economical night of entertainment with an inexpensive deck of cards.